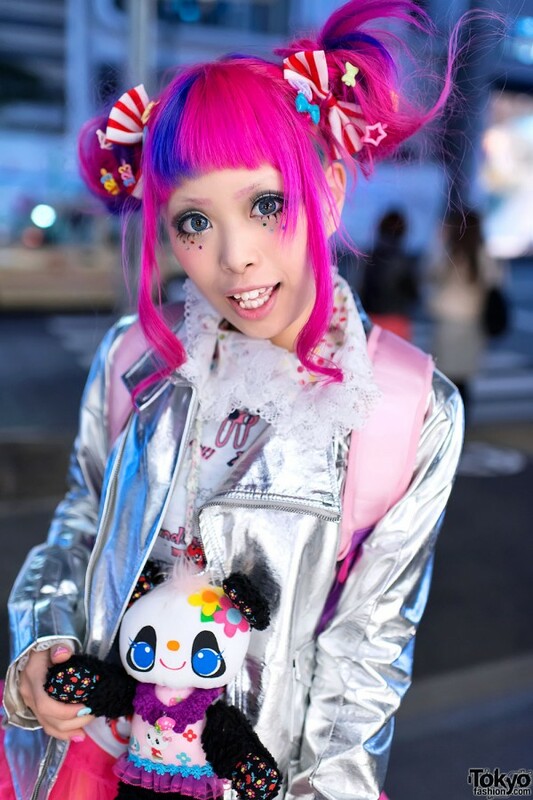 Here is one of the most consistently kawaii girls in Harajuku – Kera Magazine model, artist, and indie fashion designer Haruka Kurebayashi! We’ve been street snapping Kurebayashi (also known as “90884”) for several years now. Her outfits – and sweet personality – always brighten our day. Kurebayashi is wearing a silver motorcycle jacket over a print top with a colorful tulle skirt, teddy bear tattoo tights, striped bow socks, and blue platforms. Accessories include lots of kawaii hair bows, a lace collar, and a cute panda doll from SOL Harajuku (with whom Kurebayashi has done fashion collaborations). 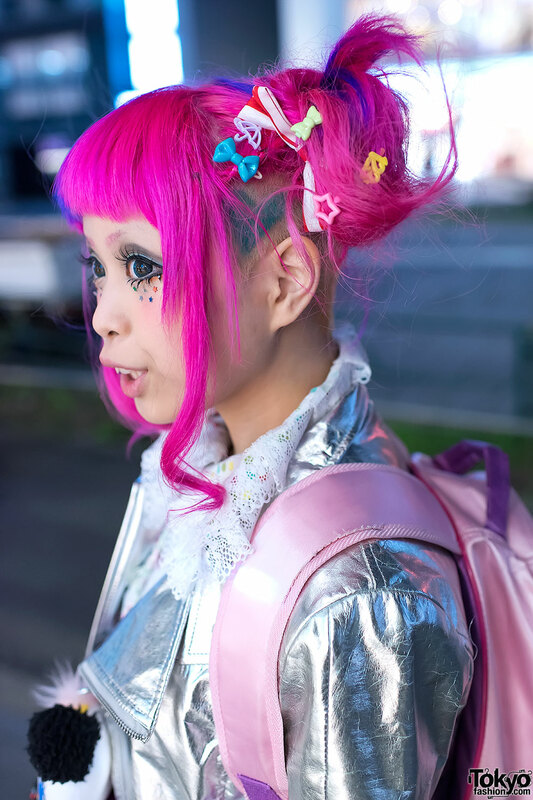 Kurebayashi’s cute pink and blue heart-shaved-into-the-side hairstyle is by the famous Tokyo salon Viva Cute Candy. 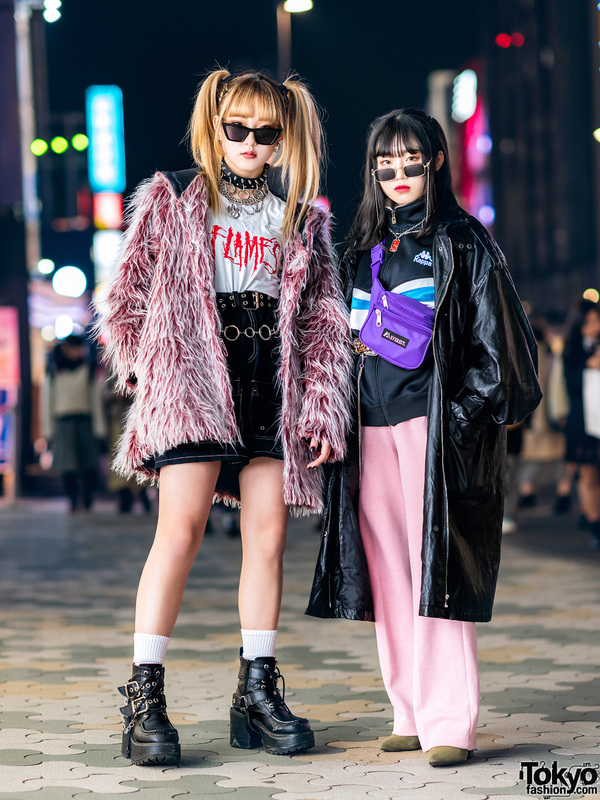 If you’re a fan of Harajuku fashion, definitely follow Kurebayashi on Twitter or check out her official blog. Love the hair and jacket! The whole outfit is quite cool, but I find the association between the platforms and the socks particularly successful ! Love it ! cool, I love the whole outfit.